With offices in Canandaigua and Saranac Lake, NY ADDENDA Business Services work with all companies doing business in New York State. The full utilization of technology enables us to work with anyone, anywhere. Whether we communicate in-person, by conference call, text, email or SKYPE, communication is essential to a successful work relationship and mutually satisfying outcome. > any other work-related issue - seriously, just call me. If I can't help you, I'll refer you to someone who can. > Could you use help in boosting the sale of your products or services? > Needing to reduce your administrative "costs of doing business?" > Thinking about a lower cost alternative to expensive yellow page advertising and/or marketing? > Do you have peace of mind that your company is in compliance with industry specific regulations? administration, sales and/or operation can still function smoothly? We are a highly experienced, diverse team of professionals dedicated to assisting managers, business owners, professional private practitioners and non-profit executives address issues that are unique to the client. 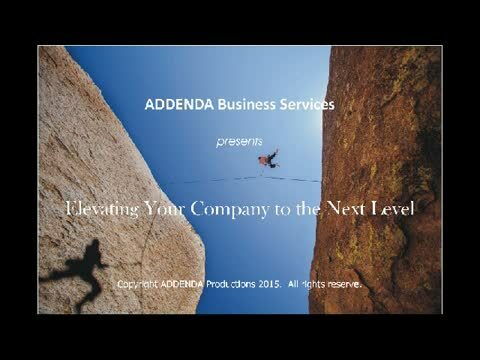 Whether you are starting a company from the ground up, have an existing company that has reached a plateau, or are managing a company that is struggling to stay open, ADDENDA Business Services is dedicated to helping you maximize your potential. We start off by doing an assessment of the quality of your products | services, the efficiency of your operations | administrative functions, the strategies of your sales and marketing efforts, the level of your customer service | client relations, and, most of all, your effectiveness of your management skills and leadership. >> I believe that when we are successful in our own achievements, we are more likely to "pay it forward" as we mentor others who desire to achieve a similar endeavor. >> I see existing business owners, executives of non-profit organizations and licensed professionals desperately needing someone to trust who will give them guidance, resources and skill sets that will help their company stand out from all others and shine like fine silver. I also see those who are employed, yet unhappy, hoping that something better and more satisfying is out there waiting for them to take hold of it. >> I hear from those who are unemployed, their need to begin feeling good about themselves, and yearn to know that they are recognized, appreciated and valued by others... that they have purpose. Yes, there are unlimited opportunities; some people just need a gentle nudge so that they can see them. These are the reasons why I created ADDENDA Business Services and Solutions over 13 years ago. One of our goals is to make sure that our clients defy the high percentage of small businesses failing within the first three years of opening their business. To that end, we apply a hands-on, proactive approach when working with your company. As our client, we will be your trusted confidant, reliable adviser, your sounding board and your problem solver. We help fix whatever it is that your organization needs fixing. Simply put, we get the job done. Although our primary market is any company with a location in New York State, thanks to technology, we can help any company or entrepreneur who has an invention, a product, a service or an idea in which they wish to turn into a money-making enterprise. The client hires us to create an action plan as to who, what, when, where, why and how he or she is going to pursue it. Once hired by you as your consultant, our role is to be by your side to help keep your company on track, measure progress, help overcome obstacles, celebrate achievements, and ultimately help you manage a successful company. By the way, our pricing structure is tailored to the individual client and is intended to fit any budget. Whether the solution is in the form of advice, outsourcing or ADDENDA serving as your company business manager, our primary aim is to help you remove the obstacles that hold your company back, so that you may proceed with growing it to the next level. >> A large manufacturer in Albion, NY needed a business loan so that he could purchase some new equipment and build an addition to his facility. The business plan and financial statements that we prepared helped him obtain the loan he needed from the local bank. >> A veterinarian purchased an existing animal hospital in Rochester, NY and needed a mortgaged loan to close the transaction within a week. The business plan that we prepared in record time helped him secure the financing and close on time. >> A salesman was under pressure by the President of his company in Syracuse, NY to put together a business development plan, showing what his sales projections were going to be and how he was going to meet his quarterly goals. The salesman asked us to help him design a plan that would overcome the obstacles so that he could meet and/or exceed his sales quota. Today, he is company sales manager for the United States Division. >> A non-profit organization in Albany, NY was applying for funding to launch a county-wide program to help troubled youth. The program director asked us to help her create the program, training curriculum, administration and budget, as required by the funding source. To date, this program has provided aid to 272 families.